LONDON, England (CNN) -- The crash of a Turkish airliner in the Netherlands and the recent landing of a jet in the Hudson River in New York demonstrate how safe modern aircraft have become, according to safety experts. Emergency services help to evacuate passengers after Turkish Airlines plane crashes in Amsterdam. The Boeing 737-800, which originated from Istanbul, Turkey, was trying to land at Amsterdam Airport Schiphol when it went down. At least nine people were killed in the crash and 50 injured, 25 of them seriously, the airport's director said Wednesday. The plane was carrying 127 passengers and seven crew members. Pictures from the scene showed the plane broken in three pieces. One tear was in front of the wing, splitting the "Turkish" logo in two, and a larger tear was farther back along the fuselage. Kieran Daly, of the online aviation news service Air Transport Intelligence, said it was clear from the New York and Amsterdam crashes that many accidents are now survivable. The pictures from the Amsterdam crash indicated there had not been a widespread fire, Daly said. He said the impact had been severe but it could have been survivable because of the lack of fire. He said there was "precious little" in common between the two accidents unless the Amsterdam incident was also caused by a bird strike. But the low number of casualties in both crashes was testament to technical advances made by the aviation industry. 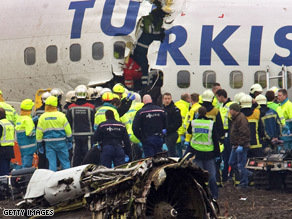 The Turkish Airlines Boeing 737-800 that crashed in Amsterdam was built in 2003 and was inspected last year, Daly said. "They really are pretty much state-of-the-art airliners with every imaginable technical benefit the industry has come up with over the years," Daly told CNN. "It is a tribute to Boeing and Airbus that their aircraft are so safe. Most accidents now are caused by single causes, like bird strikes, that you simply can't legislate against." "You would be optimistic that they would be quite survivable in an accident." Daly said the Turkish aviation industry has a "pretty good record" of safety, and that Turkish Airlines, the national carrier, has a "very good record." The airline's last accident was of a small commuter jet in 2003, he said. It was a fatal crash that happened at a remote airfield in eastern Turkey, he said. "Their mainline operation is safe," Daly said. "Their pilots are well thought of." The last accident at Schiphol Airport happened in December 2003 when an EasyJet flight carrying 103 passengers to London collided with a lamppost while taxiing during icy conditions, according to Aviation Safety Network's Web site. The crash caused significant damage to the aircraft, but no one was killed. The other two most recent accidents at Schiphol -- in 1998 and 1997 -- also resulted in no fatalities, according to the network. The last fatal incident at the Amsterdam airport happened in April 1994 when a KLM aircraft crashed shortly after takeoff as it tried to return to Schiphol. Three of the 24 passengers and crew members on board were killed. Another airline expert, Philip Butterworth-Hayes, said the safety of the Boeing 737 along with the five runways of Schiphol Airport in Amsterdam and its advanced safety systems would have helped as the pilot tried to land the plane. Stressing that it was too soon to speculate about the cause of Wednesday's crash, he said the pilot appeared to have control of the plane a long way down its approach to the airport. It landed close to a remote runway at the airport, and its five runways would give flight controllers more options in bringing down a plane that was in trouble. CNN's Richard Quest said on older aircraft the seats would have come apart "but in this case the seats and their belts saved them."